Probably the most widely used typeface in the world, Helvetica has been around since 1957. 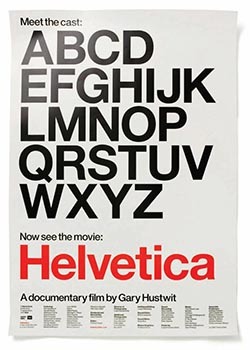 Back in 2007, to celebrate the famous font’s 50th birthday, a feature-length movie was made, focusing on the history of Helvetica and its creators. Take a look at The Guardian newspaper's interview with the movie creator, Gary Hustwit — it make an interesting read. Famous logos designs based on Helvetica include, American Airlines, Lufthansa, Nestle and Harley Davidson. Launched by Microsoft in 1994 and often dubbed ‘the cliché of all clichés’, Comic Sans is one of those overly used fonts people love to hate. In case you’re wondering, designer Vincent Connare is the man you want to thank. I recommend taking a look at the website of award-winning author of Design Hackers, David Kadavy, he really gives a thorough (and funny) overview of the "child-like handwriting that is so infamous, there is a movement to try to ban it." Commissioned by British newspaper The Times, in 1931, Times New Roman was created by Victor Lardent. Even though the newspaper no longer uses it, Time New Roman is a standard Microsoft font these days and remains very popular. Garamond is a serif typeface designed by French craftsman, Claude Garamond, in the 16th century. Rumor has it Garamond requires considerably less ink than Times New Roman. Do you remember that story back in 2014, when a 14 year old boy announced to the US Government that he had a simple way to save them $467m, just by changing the Government font style to Garamond. Read the story here. Did you know that Garamond is the font of choice for Dr Seuss and the Harry Potter books? The similarities between Arial and Helvetica are no coincidence: Arial was purposely created as a free alternative to Helvetica, with identical character widths. It is widely considered one of the best fonts to use for optimal reading speed and is the most popular font for regular computer users. For a deeper dive into Arial, take a look at Mark Simonson article The Scourge of Arial. 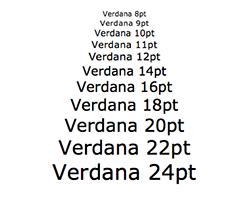 Released in 1996, when screen resolution was quite poor, Verdana was specially designed to remain legible on screen at small point sizes. It's OK to use Verdana for certain home or office printing for short texts but should be avoided for offset printing and text-heavy documents. Although Futura was designed in 1927, the font still looks as fresh and modern as ever. Inspired by the Bauhaus design style, creator Paul Renner based Futura on geometric shapes. The font was designed in the context of the New Frankfurt project (a public housing project at the time). Not many people know this but Futura was the first font on the moon! Read about its epic journey here. No matter how famous they are, fonts can always cause problems in PDFs. Learn more about missing fonts and discover how to fix the problem with PitStop Pro!